The Nordic countries have a veritable smörgåsbord of relationships with the European Union, from in, to out, to somewhere in-between. So, what does that mean for Scotland? Enriching debate about Scotland’s post-Brexit future, Lesley Riddoch and Eberhard Bort, with a little help from their Nordic friends, examine key questions in this informative book. The Nordic nations co-exist quite happily despite having thrashed out every conceivable variation of relationship with the EU. Some are in (Finland, Sweden, Denmark) some are out (Iceland and Norway) and the smallest players have managed to shake it all about (The Faroes and Greenland are out while their ‘Mother Ship’ Denmark is in). These two tiny Nordic players have a few formal agreements with the EU, whilst Norway pays to retain access to the single market. Denmark is in but its people rejected Euro membership in a referendum, whilst the Finns are all in – members of the EU and the Euro. Surely, among all this kaleidoscopic variation there are lessons for Scotland to learn – as a devolved government within the UK or possibly a small northern independent state sometime in the future. Another way to characterise this diversity of European relationships is to look at it from west (where fishing limits matter hugely and most Nordic states are outside the EU) to east (where the frontier with Russia/USSR has concentrated minds about the need for European solidarity for decades). For Greenland, Iceland and the Faroe Islands, fisheries are not just important, they are the defining feature of their economies. Greenland and the Faroe Islands, self-governing parts of EU member Denmark, are outside of the EU because they did not want to become subject to the Common Fisheries Policy. With fishing accounting for 90 per cent of exports from the Faroe Islands, these concerns remain in place. The Faroese used their devolved powers to decide not to follow Denmark into the EEC in 1973; Greenland, which had become a member of the EU when Denmark joined, followed the Faroes after home rule was introduced, with a referendum in 1982 in which 53 per cent voted to leave the EEC – again one of the biggest deciding factors was the Common Fisheries Policy. For Iceland, too, the EU has been a contentious issue for years. A member of the EEA and EFTA, the barrier to EU membership has been the Common Fisheries Policy – fishing, of course, represents a vital part of the Icelandic economy. Norway, with its population of just over five million, is in the European Economic Area (EEA) and a member of the European Free Trade Association (EFTA). More than 80 per cent of Norway’s exports go to the EU, and more than 60 per cent of imports come from EU countries. 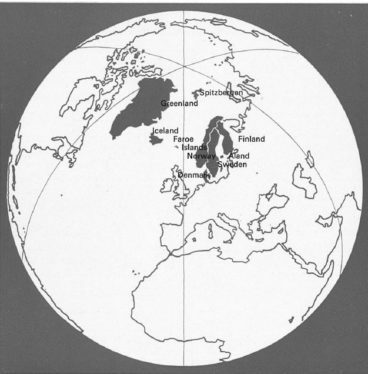 Norway decided not to join the European Community in 1972 (in a referendum, 53.5 per cent voted against), and reaffirmed that vote in a second referendum in 1994 (this time, EU membership was rejected by 52.2 per cent). But Norway participates in the Single Market and in Schengen, paying an estimated €9bn as an annual contribution to the EU. Crucially though, it is not part of the common fisheries and common agricultural policies. Moving east, Denmark, Sweden and Finland, are all less economically dependent on fish and joined the EU to safeguard economic growth within the Single Market, and to promote stability with the EU peace-keeping bloc. The Cold War experience and its long shadow – the presence of the Soviet/Russian frontier loomed larger here – influenced attitudes towards the European Union. But there are still differences. Denmark is widely regarded as one of the EU’s most reluctant players and has voted against EU treaties several times and negotiated four opt-outs. Thus, Denmark is not participating in the common currency and remains exempt from parts of the EU’s criminal justice and home affairs system – something it negotiated in 1993. Like Denmark, Sweden has stayed outside the Euro. Only Finland is fully committed to all aspects of EU membership, having been in the Euro from the start. Reviewing this smörgåsbord of European relationships, where does a post-Brexit Scotland fit in? As we consider our post Brexit options, might we be eyeing up the wrong European prize? Might the halfway house of the European Economic Area (EEA) suit Scotland better than full EU membership? These questions were all posed at the ‘Scotland after Brexit’ conference in October 2016 when speakers from five Nordic nations explained their very varied outlooks on the same question facing Scotland – is EU membership desirable, oversold or essential? It rapidly became clear that Britain and Scotland were not the only nations with mixed views about the EU. 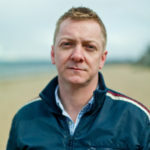 The Norwegian environmental scientist Duncan Halley explained that in 1992 Norway joined the EEA (essentially the EU’s Single Market mechanism) as a precursor to full membership after a referendum in 1994. But fierce debate produced a no vote and the halfway house of the EEA became Norway’s permanent home. Iceland’s EEA entry the same year had a slightly different genesis. According to the former Social Democrat leader Jón Baldvin Hannibalsson who masterminded EEA membership, access to the European single market looked like a good way to liberalise a 1960s economy ‘more rigid than the Soviet Union.’ But because of Iceland’s reliance on fishing and relatively recent independence from Denmark, a complete transfer of sovereignty to the EU was not on the cards. ‘People said: “We’ve had 600 years of European colonialism – no more.”’ It took five years to negotiate the EEA agreement, but it was finally signed, according to Hannibalsson, because an interim solution was mutually beneficial for the EU and small countries like Iceland. The original EFTA – members (The Nordic 4 and the Alpine 3, Austria, Switzerland and Lichtenstein) then conducted more trade with the EU than the USA and Japan combined. 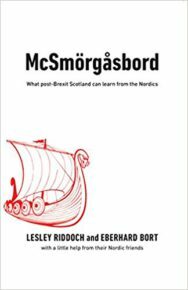 McSmörgåsbord: What We Can Learn from Our Northern Neighbours by Lesley Riddoch and Eberhard Bord is out now published by Luath Press priced £7.99.